The 'Marylebone' heeled ankle boots from Mulberry combine unquestionable English character with quality materials and craftmanship. 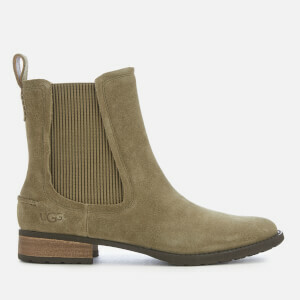 Crafted from soft suede with a velvet-like surface that is created by double buffing and brushing the leather skin. The boots showcase a slightly squared toe and a calfskin leather lining with foil branding. A row of brass press studs open on the exterior side for easy on-off access. Set on a patent stacked leather heel. Dust bag included.